February – when symbols of hearts are everywhere. In addition to containing one of the most romantic holidays of the year - Valentine’s Day - it’s also American Heart Healthy Month. And what is the magic potion for mixing heart health and romance? Why, olive oil, of course! Throughout history the olive tree has been cultivated and prized, known not only for its fruit but also for its liquid gold. Hippocrates, the Father of Medicine, didn’t coin the phrase SuperFood, but he might as well have, when he advised: "Let food be thy medicine and let thy medicine be food." Yes, one of his “medicines” was olive oil. Democritus, the philosopher/scientist who developed the theory of cause and effect, extolled olive oil as a major cause of longevity. Cleopatra, Queen of Egypt, lured her lovers with concoctions made from herbs and olive oil. And continuing a two thousand-year-old tradition, the beautiful Sophia Loren drinks olive oil as part of her daily beauty ritual and uses it in her baths. Olive oil is not only good for you on the inside; it’s good for you on the outside as well. What is the most noted of the health aspects of olive oil?The most noted of the health aspects of olive oil is that it is 100 per cent “good” fat and is heart healthy. Olive oil is one of the top foods recommended to promote cardiovascular health. Thousands of scientific studies (and the American Heart Association!) declare the Mediterranean Diet one of the world’s healthiest ways to eat. A major component of the Mediterranean Diet is olive oil, which has long been considered one of the most important of natural oils essential to human health. These studies reveal that people who consume a diet rich in olive oil tend to exhibit better heart health than people whose diets contain other forms of fat, especially animal fats. Heart disease is often called the silent killer, because we don’t feel our blood pressure slowly increasing or our blood vessels narrowing and building up with plaque. A healthy diet is the best defense against high cholesterol, high blood pressure and excess body weight (the three main factors contributing to heart disease). And part of a healthy diet is, of course, olive oil. In addition to its anti-oxidant properties, extra virgin olive oil is a monounsaturated fat. It offers protection against heart disease by controlling or lowering LDL (bad) cholesterol, while raising HDL (good) cholesterol levels. In fact, studies show that consuming two tablespoons of olive oil per day may reduce the risk of heart disease. It is also laden with antioxidants (polyphenols), which offers protection against the aging of the skin. The message is simple – if you love your heart - change your oil! Use as a Moisturizing Lotion: mix equal amounts of olive oil and water and use a frother to emulsify. Give and/or Get a Massage: make your own massage oil by adding essential oil of lavender (known as the oil of love) to your olive oil moisturizing lotion. 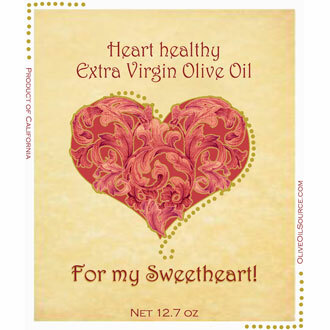 Make February your heart health month and make olive oil one of the main ingredients in your recipe for love. Share your heart with the ones you love, but take time to share your love and your EVOO with your own heart!